National Apprenticeship Week takes place on from the 9th to the 13th March 2015. With the UK skills gap widening, more Apprentices are needed. National Apprenticeship Week (NAW) is all about encouraging more small businesses to take on apprentices as well as promoting the wide range of apprenticeships that are on offer, including those at higher level and within blue chip companies. The week is also a celebration of apprenticeships and the level of success that learners can achieve and the positive impact they have on individuals, businesses and the UK economy. This will be shown with statistics and case studies from the National Apprenticeship Service (the government body organising NAW). SMEs are central to apprenticeship reforms, such as their involvement in setting new apprenticeship standards known as “Trailblazers”. There has never been a better time to hire an apprentice. They will help a business grow their own talent by developing a motivated, skilled and highly qualified workforce. The National Apprenticeships Service provides a dedicated service to employers, offering free, expert advice and support to those looking to recruit apprentices or take on a trainee for the first time, or expand their apprenticeship programme. Logic4training can also help if you are looking to recruit apprentices in the gas utilisation industry. We work in association with Luton Borough council’s Adult Learning service alongside employers to fully support them through the recruitment and funding process. Like, follow and share “Apprenticeships” on Facebook, Twitter and Linkedin. Invite a teacher and some year 9-11 pupils from a local school to job shadow some of your apprentices in the workplace. 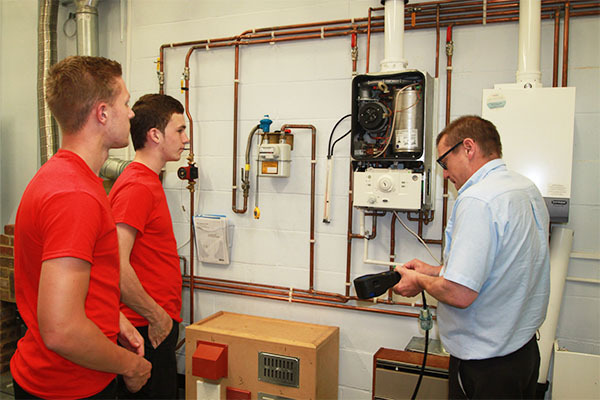 Interested in taking on an apprentice in the plumbing and heating industry?